THE characteristically colorful Peking Opera masks emerged around 1894. A man of the Manchu ethnic group with the last name of Gui, who ardently loved Peking Opera. One day, he saw clay figurines in a temple fair, and at that moment an inspiration came to him to use a puddle to make a face-shaped mold. After making the mold, he dried it in the sun, and drew outlines and colored it according to the facial make-up of Peking Opera actors on the stage. For his creation, Gui became famous among Peking Opera fans in Beijing and was called “Painted face Gui” thereafter. 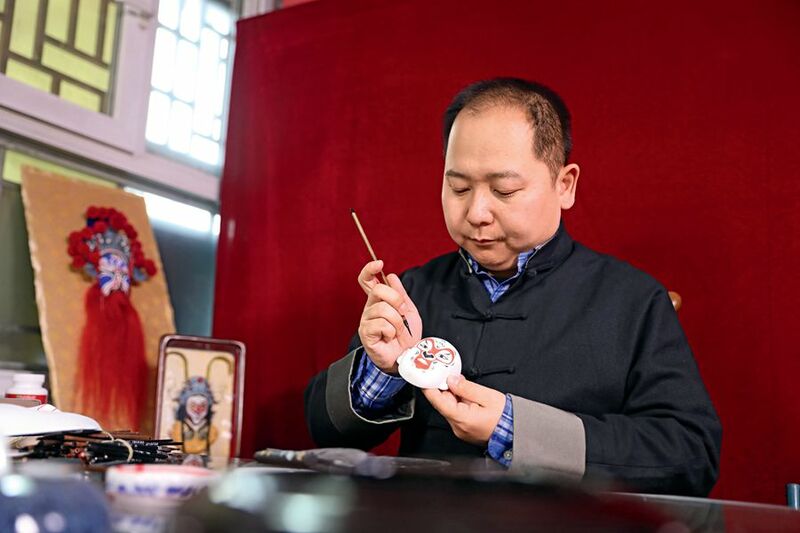 Lin Hongkui, the fifth generation successor of Colored Peking Opera Masks, is painting a mask of the Monkey King in his studio in Beijing on January 8, 2019. For sure, colored Peking Opera masks appeared after the emergence of Peking Opera. But before their appearance, Beijing’s painted clay sculptures had been commonly seen, such as Sorcery Nuo Play masks or other similar handicrafts. In Chinese culture, traditional facial makeup on the stage is mainly applied to two genres of male actors: Jing (males with strong characters) and Chou (clowns). Different actors wear different facial makeup; the painted faces carry artistic functions: it is a way for audiences to read the characters’ mind. That’s why the facial makeup is called “the mental pictures” of characters. As a beloved form of art among Peking Opera enthusiasts, colored Peking Opera masks are acknowledged, both at home and abroad, to be a symbol of Chinese culture. Beauty and ugliness are unified in one mask, and a person’s characteristics and traits get portrayed through certain colors and lines. The use and choice of color is also an art in itself. Apart from aesthetic functions, different colors combine to manifest the personalities of different roles when applied to different patterns. For savvy audiences, the facial makeup is a direct way to tell whether the character is a hero or a villain, smart or stupid, beloved or hated. To be specific, the meanings of the colors used in Peking Opera facial makeup can be summed up this way: red generally represents loyal and heroic characters such as Guan Gong, a general in the Three Kingdoms Period renowned for his loyalty. Black in general indicates integrity and selflessness, which can be found in Bao Gong, a legendary upright official of the Northern Song Dynasty. White generally means evil, represented by the famous character Cao Cao, a cunning statesman of the Wei Kingdom during the Three Kingdoms Period, and gold is usually used to depict the immortals. As people’s eyes and face are like a window into their soul, to Peking Opera audiences, facial makeup is of great significance in arousing the aesthetic feelings of the audience as it is the visual center. In the understanding and appreciation of it, facial makeup has a relatively independent aesthetic significance, though it is, in the final analysis, always an organic part of the performing art of Peking Opera. As a result, the understanding of it can only be fully realized by watching actors performing in different costumes. Painted opera masks were originally clay imitations of the facial makeup of the performers on the stage of Peking Opera. Before the appearance of three-dimensional opera masks, drawings of the facial makeup had been commonly seen. 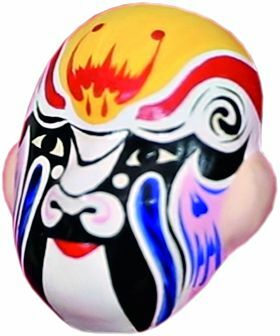 As to the production techniques and varieties, painted Peking Opera masks have undergone a lot of changes. There are three basic kinds of them. The first kind is a baldheaded face with neither long beard nor helmet. These are only the simplest patterns in different colors drawn on the eyes, nose, mouth, eyebrows, and ears. After years of development, this kind of mask still remains a classic kind today. The second type is painted faces with clayed beard and helmets. The clayed beard is painted colorful, and the face is decorated with simple headdress. The third kind comes in complete sets. A typical scene or the highlights from a Peking Opera play is selected, which usually involves several characters. Painted Peking Opera masks wearing helmets emerged in the 1980s. The helmets are a reduced scale of those worn by the stage characters, turning dramatic helmets into handicrafts. The production is both time and energy consuming, but the finished products are exquisite and beautiful. 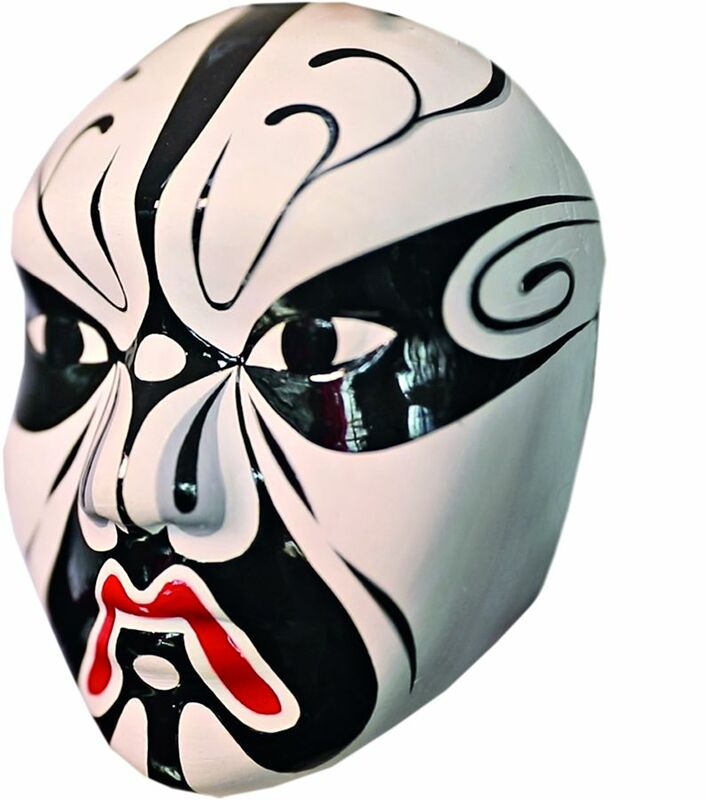 The development of painted Peking Opera masks is inseparable from the innovation and promotion of generations of craftsmen. Changchun Temple, known as “the first temple of Beijing,” is home to the Intangible Cultural Heritage Protection Center of Xicheng District, Beijing. Studios of nearly 10 intangible cultural heritage programs of Beijing are located here. Lin Hongkui, the fifth-generation inheritor and disseminator of colored Peking Opera mask making craftsmanship, is busy working in his studio, on the walls of which hang a variety of colored Peking Opera masks. Lin learned facial makeup painting and stylistic design from Tong Xiufen, his mother. He told us that the painting of colored Peking Opera masks strictly follows the facial makeup of Peking Opera actors. A suitable mixture of Yixing clay is picked first to make molds. Then, after brushing the molds with white pigments, the black outline of a face is drawn. The last step is to fill in the molds with different colors to form symmetrical and lively patterns. Lin majored in multimedia technology back in college. After graduation, he had a stable and decent job in Beijing. In his spare time, he would give a hand to his parents on the making and promotion of colored Peking Opera masks. After 2008, busy at both ends, he chose to quit his job and devoted his life to carring on the art of his parents. Now, instead of painting it, he spends most of his time promoting the art. His studio cooperates with universities and primary schools in Beijing to bring Peking Opera masks to schools. Abroad, he is often invited to participate in cultural exchanges in Europe and America. In recent years, he has spent almost half of his time on business trips. During the Spring Festival holiday of this year, he will go to New York, Denmark, Norway, and Iceland to participate in cultural exchange activities. Lin is full of ideas. As a millennial, he has made his innovation on this art from the perspective of young people. In his eyes, Chinese traditional art, including painted masks of Peking Opera, was born out of the life of ordinary people, and their vitality also comes from there. Therefore, only by embracing the era and shrewdly combining it with the current public preferences and advanced technology, can traditional culture be handed down to succeeding generations. In practice, he also found key innovations. He and his college classmates designed computer software with detailed guidance at every step for painting facial makeup masks, making it convenient for students to learn the painting skills. The more they participate, the deeper they will understand this art. Besides this, Lin adds adorable cartoon bodies to the masks, which immediately attracted the attention of young people. 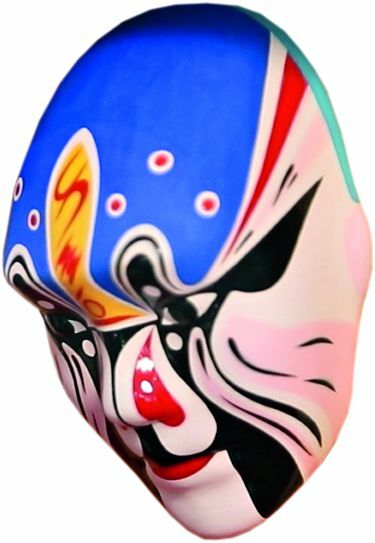 As a work of art, colored Peking Opera masks highlight certain complex male characters on the stage in an exaggerated and imaginative way which combines realism with symbolism. A small mask almost reveals everything about the character, which is quite surreal. While to fans, it is also a spectacle to behold. Once fans close their eyes, the images of Peking Opera characters such as Bao Gong, Guan Yu, and Monkey King will all come alive in their heads. When the lifelike facial makeup on the stage is fixed on the masks with the help of craftsmen, this traditional skill with Chinese wisdom carries on. In 2009, the colored Peking Opera masks were included into the Beijing Intangible Cultural Heritage Project list. This recognition brought it greater honor and increased attention, and also inspired future generations of inheritors.